Meet 14 cool sharks (and one manta ray) and see why it's important to BE NICE TO SHARKS! Though they’re often portrayed as vicious man-eaters, sharks actually kill fewer than 10 people per year. Yet those myths cause real harm: many species are being hunted to extinction, with as many as 100-200 million sharks being killed each year. 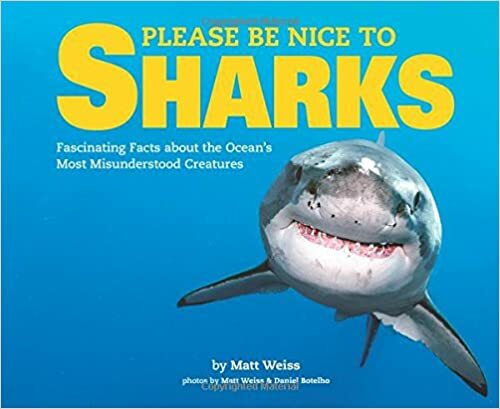 This humorous book humanizes the incredible shark through breathtaking, original, underwater photography along with incredible facts about these amazing creatures in the wild—sending kids a crucial message about conservation in an irresistible format. Matt Weiss is the owner of Dive Photo Guide and is a diver, photographer, biologist, author, and ocean lover. Please Be Nice To Sharks is his first children’s book. Follow him on Twitter at either @MattDPG or @DivePhotoGuide and learn more about him on his website: DivePhotoGuide.com. Matt lives in New York. Cassandra's Review- The photos are what really caught my family's interest the most. Of course if you have a lover of sharks in the family or a youth ready to learn, this is going to be a real treat. It is packed with facts and introduces sharks as a new fresh way to keep your kids interested and safe.